The SR200 Series Boxcar Averager System is a modular instrumentation platform designed to acquire and analyze fast analog signals. The system consists of a NIM compatible mainframe and modules which can be selected to tailor a system to individual requirements. The SR200 series is flexible enough to handle gate widths from 100 ps to 150 µs, repetition rates up to 50 kHz, and has both analog and digital outputs. With its low-noise inputs and low-drift outputs, the SR200 series is the standard for gated integrators and boxcar averagers. Boxcar Averaging refers to the practice of averaging the output of the gated integrator over many shots of the experiment. Since any signal present during the gate will add linearly, while noise will add in a "random walk" fashion as the square root of the number of shots, averaging N shots will improve the signal-to-noise ratio by a factor of √N. The SR200 series is designed to work without a computer, allowing you to quickly "tune-up" your experiment, or with a computer, automating complex measurement sequences. 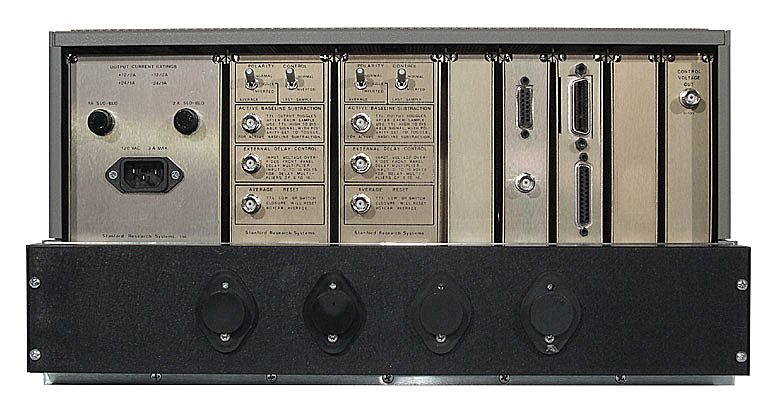 Modules like the SR235 Analog Processor perform signal processing functions (e.g., ratioing and background subtraction) without the need for a computer, while the SR245 Computer Interface gives you complete access to boxcar measurements over GPIB or RS-232. The SR200 series modules are briefly described below. Further details, including specifications and features can be found in the following pages on this website. The SR280 Mainframe and Display module is a rack-mountable NIM bin which can house up to nine single-width NIM modules. The three right-most slots in the bin are occupied by a NIM-compatible power supply and display which provides ±12 V and ±24 V to the other NIM modules. The display module also contains an analog meter, digital meter, and bar graph meter which are useful for monitoring the output of the boxcar system. The SR250 Gated Integrator module is the basic building block of the SR200 series. The SR250 is a complete, single-channel gated integrator and boxcar averager with gate widths from 2 ns to 15 µs. You can average from 1 to 10,000 samples, and the "last sample" feature lets you bypass averaging and access the gated integrator output directly. The SR255 Fast Sampler allows you to do gated integration with gate widths as short as 100 ps. Four discrete gate widths are provided: 100 ps, 200 ps, 500 ps, and 1000 ps. Output is provided in both analog and digital form. The SR245 adds both analog and digital data acquisition capabilities to the SR200 series. Eight analog I/O channels can be configured as inputs or outputs, and two front-panel digital I/O ports are provided. The SR245 can communicate with a computer over the RS-232 and GPIB interfaces. The SR240 contains four DC to 300 MHz amplifier channels, each with a gain of 5. The SR240 is ideal for amplifying low-level signals from photomultipliers and photodiodes before being measured by the SR250. The SR200 Gate Scanner is designed to automate waveform recovery by providing the voltages needed to scan the SR250's gate delay. Scan times from 10 ms to 5 minutes can be selected. 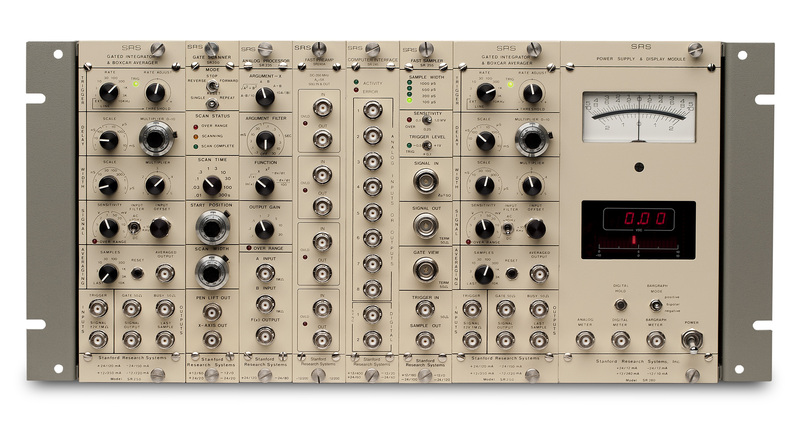 The SR235 Analog Processor performs a variety of functions without the need for a computer. Its two inputs can be combined to form an "argument", A, B, A-B, AB/10, 10A/B, or √(A2+B2). The SR235 then outputs a function F(x) of this argument corresponding to x, x2, ln(x), dx/dt, or (dx/dt)/100. The SR272 is a Windows compatible software package designed to acquire, display and analyze data taken with the Boxcar system. The program works with the SR245 Computer Interface module over the GPIB or RS-232 interface. Features include on-screen cursors,auto-scaling, smoothing, and curve fitting.